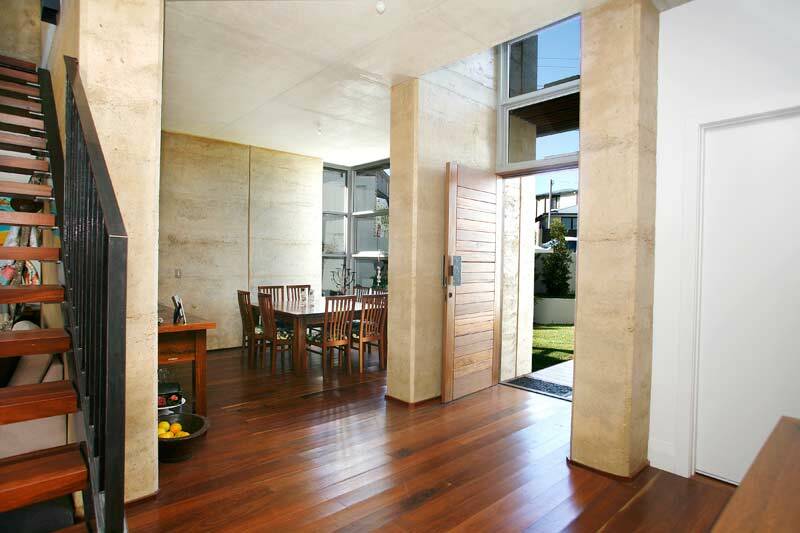 NEWS: Rammed Earth House Coogee in is finalist the Randwick Council Urban Design Awards, Residential – New Home category. 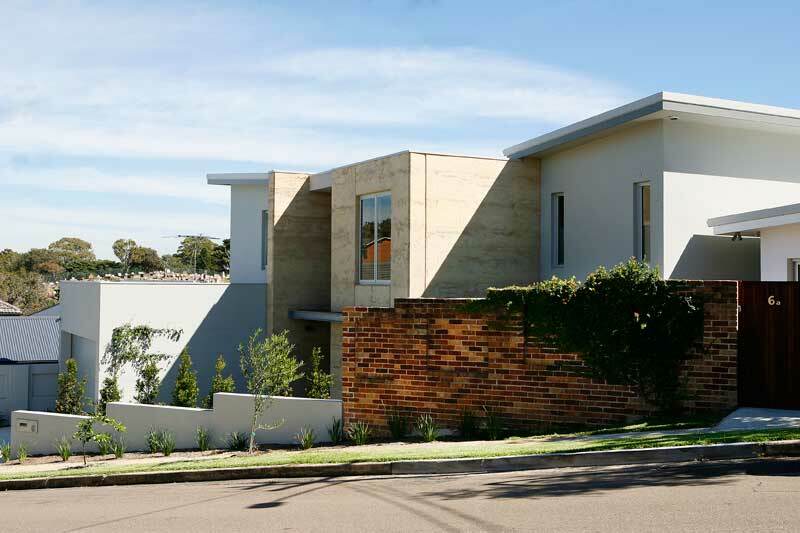 Below is written rationale about a new, rammed earth wall house at Evelyn Street Coogee. A central requirement of this project was to reinforce the idea of the family home through considered planning arrangements and the use of raw materials, natural colours and textures. The intention was to bring warmth and simplicity into the often multifaceted, complex world of family: To be the foundation and place of permanence behind the buzz and movement of family life. Accordingly, planning was to facilitate this activity, not necessarily with large open living spaces but arranged to accommodate specific tasks. Individual spaces taken across the northern boundary defined and inter connected, linked with the garden and pool but not en masse. Placing activities such as arts and crafts in their own niche but not set apart from the other essential workings of the family. Centralised along the street frontage to the south, the entry lobby directs occupants through to the main circulation spaces of the house, flanked by the formal areas, amenities and services rooms. There is a sense that spaces are being allocated but not closed off. So too, the main stair to the upper lobby is set behind and against a rammed earth wall. It is not fully open, but enough to form a visual link with the high vertical windows and voids near the entrance. The stair opens to another, northern orientated family room before leading off to the four main bedrooms. Again, views down into the garden and pool area reinforce the connections between the various functions of the house. 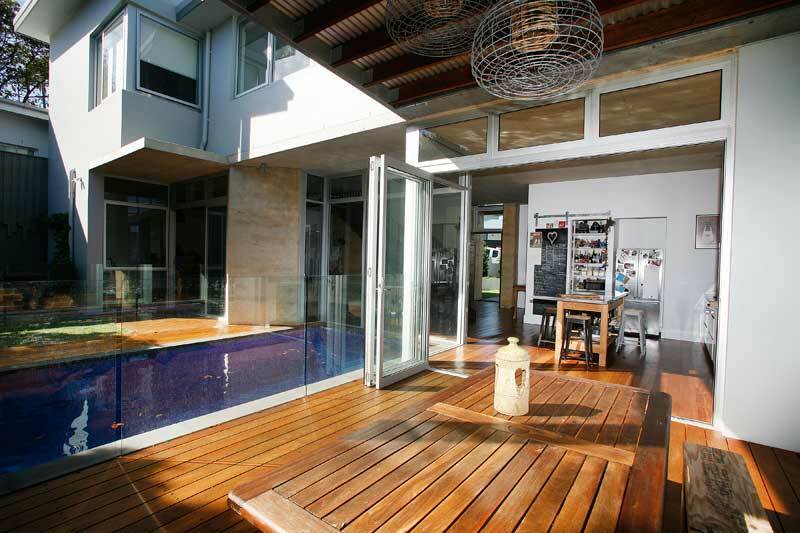 Contained within the naturally higher level of the property to the east is a granny flat. It is screened and private from the main house and yet included in the circulation movements around the site via an existing curved, stone stair. This provides direct access from the garden whilst allowing the dwelling to have its own identity, complete with a direct street address and front courtyard: A self contained dwelling where extended family might stay and enjoy a sense of inclusion and place. The location of Evelyn Street and the surrounding area of Coogee have been undergoing urban transformation for some years. Many inter and post war period cottages have been made over, altered or simply demolished for new contemporary homes. Nevertheless, the buildings have remained domestic in scale, predominately double storied but somewhat tempered in height as designs negotiate steep, hillside locations and potential view losses from neighbouring sites. In a number of ways, this development has benefited from pre-existing, site specific conditions which have helped to fit the building comfortably into this hill and coastal location. The site is wider than it is deep, allowing a generous northern outlook across the garden and a short exposure to the east and west where step downs occur along the contours. Pre-existing building platforms, left by the previous houses, have already dealt with the expensive issues of retaining walls and earth works. Accordingly, interesting material selections for these walls, fences and landscaping elements have been retained in surprising ways, contributing to a new interpretation of the site and its surrounds. Similarly, the splayed front boundary at the street alignment, rather than being a barrier to the new design, encouraged a stepped and faceted facade, modulating the building into smaller elements in keeping with the scale and proportions in the street. In such ways, the site and its natural coastal, hillside location help to frame and create the new build in unexpected and interesting ways. Whilst drawing from a palate of raw, earthy textures and finishes, both new and retained from the site, the design nevertheless re-interprets their value in a contemporary way. 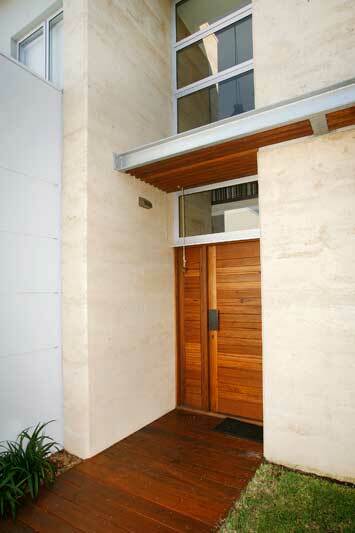 Rammed earth walls are used extensively to the street facade as strong, simple features to mark entrances and establish warm, interior backdrops. 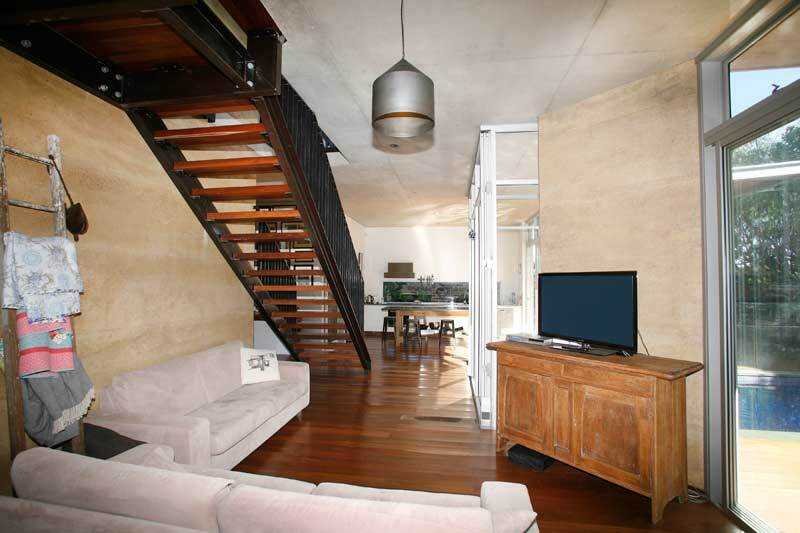 To the ground floor, off form concrete is left expressed as ceilings to compliment the earthy coloured walls. Steel stringers support timber treads without overly complex trims and coverings. 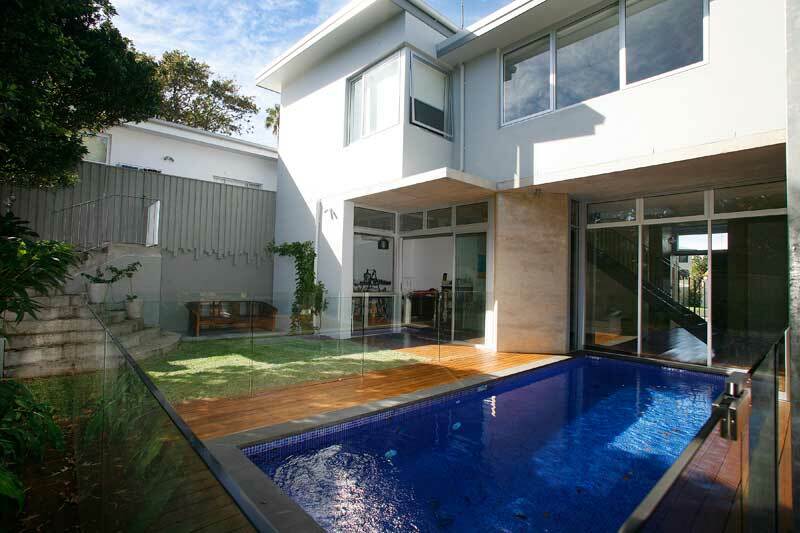 The water from the swimming pool is brought partially into the depth of the house as a basic rectangular block, framed only by glass and a narrow coping. 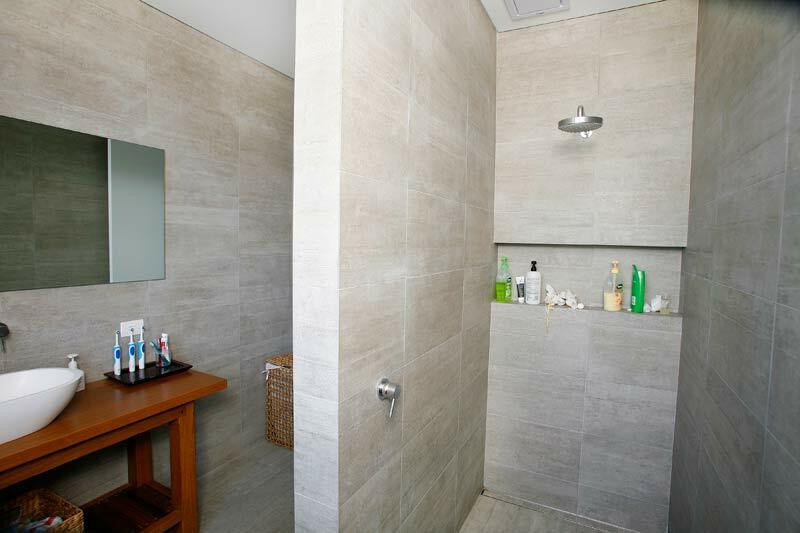 Clear timber finishes are used not only for the floors but also as bathroom and kitchen bench tops, externally for louvre screens and importantly, for the main front door. Existing face brick fences and curved stone stairs are again, simple features which add depth and texture against a cool grey wall colour. 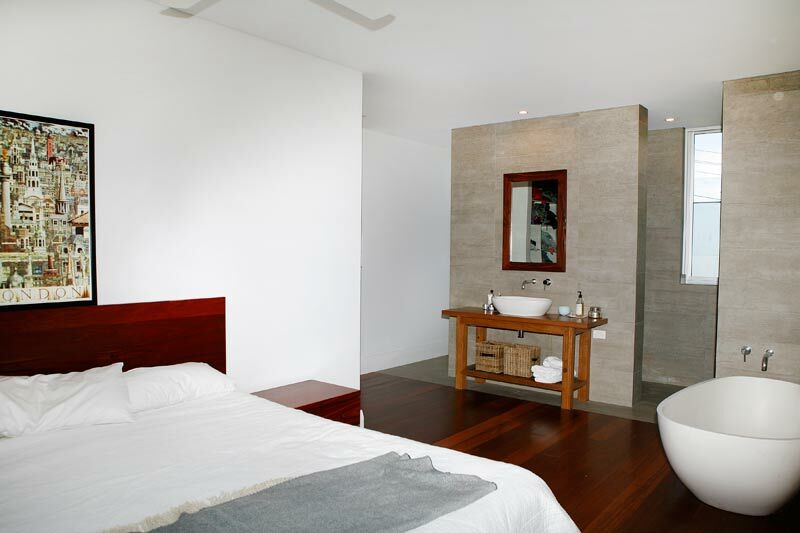 Ordinary or common choices in themselves but when brought together in a contemporary way are surprisingly fresh and new. All are contained within two simple butterfly roofs which straddle the more static, rammed earth walls that are front and centre. The shape of the site, the established stepping platforms and, as indicated above, the retention of some important existing landscaping features, are also critical in encouraging a number of passive design strategies. The site is much wider than it is deep. Accordingly, this produces a strung out building, its longer axis parallel to north. With protection given to the glazed northern walls and its shallow building depth, sun and light are allowed well into the centre of the house in winter and minimised in summer. Cross breezes are taken across this same long axis. Conversely, the much shorter, east and west facades are far less exposed, protected by the large stepped retaining walls and fences which regulate changes of level across the site. This reduces the impact of low level, uncontrolled summer sun. 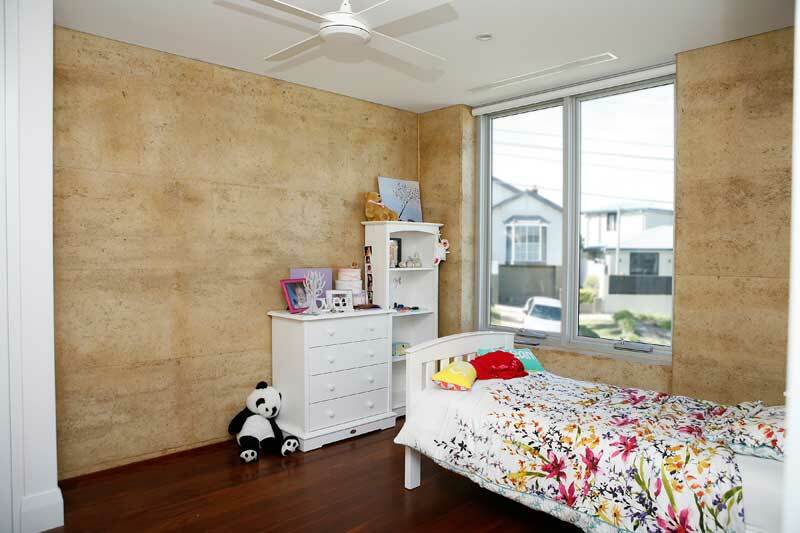 The rammed earth walls, at 400mm thick, have a naturally high level of insulation and are supplemented elsewhere by high thermal mass concrete floor slabs and double brick walls. Two large roof areas, also with high levels of insulation, have been arranged to channel all the stormwater via a smaller, lower roof where it is gathered in a rainwater tank for re use in the garden, laundry and pool. Finally, the fortuitous retention of existing land forms, retaining walls, building platforms, stairs and face brick fences have not only saved money but reduced waste, minimised new structure and provided a number of passive design features for the building. 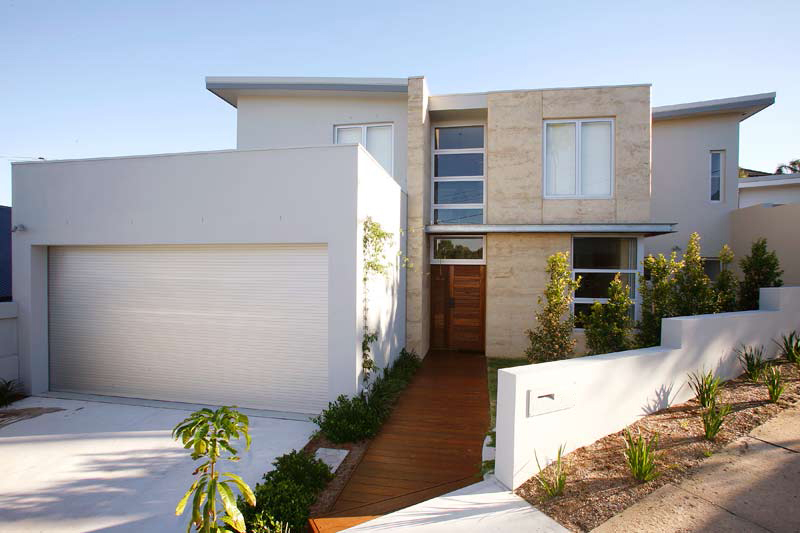 The house on Evelyn Street was conceived as a practical design response, an interpretation of family and home. The functions of the building are defined and respected through careful planning, interlinked and anchored by a backdrop of simple, earthy colours and materials, all within the frame work of its surroundings. A home that is made of otherwise simple pre-existing and new materials; earth, water, timber, concrete, steel and brick, are worked around each other to instil a calmness and an order throughout the varied movement of daily life. 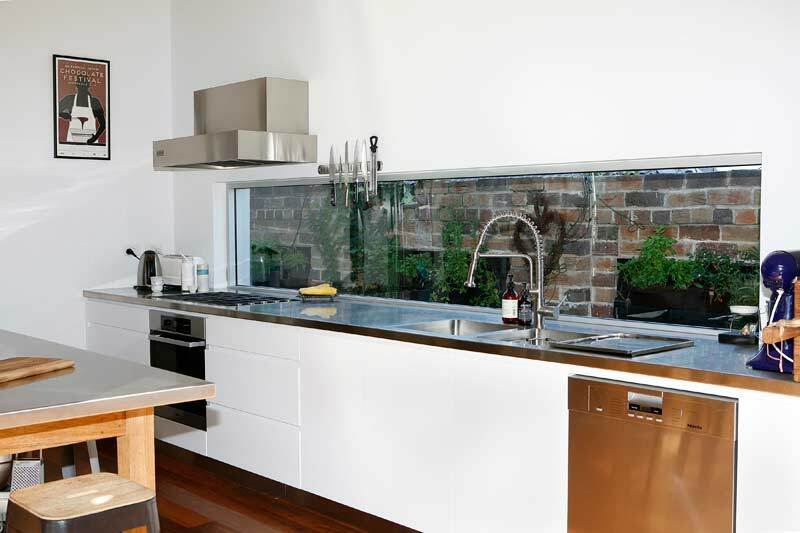 Sometimes the intention is to surprise like the view over the functional work surfaces through the glass splash-back where green leaves grow over existing clinker bricks. Sometimes it is to cause reflection when dappled light crosses the concrete ceiling cast by the pool. 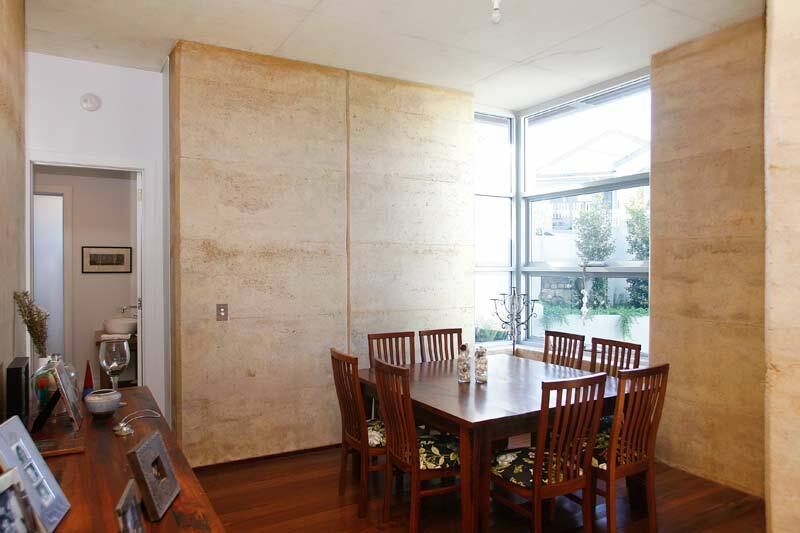 Sometimes, it is a warmth provided by the colour of the rammed earth walls against the cool concrete or when seen behind the industrial light fittings. Importantly, it is the visual and atmospheric connections between the family comings and goings which sometimes make a house a home.